This is always a big hit as an appetizer with my friends and family. It’s very simple and a great way to get kids to eat veggies. 2Prepare a baking sheet by lightly oiling or spraying it with cooking spray. Press the crescent roll dough into the pan to flatten it into a thin crust. Allow the dough to rise for 5 minutes, then pierce the dough throughout with a fork. 3Bake dough for 10 minutes and then let cool. 4To make the "Sauce," combine all of the sour cream, cream cheese, and sauce ingredients into a medium size bowl and mix well. 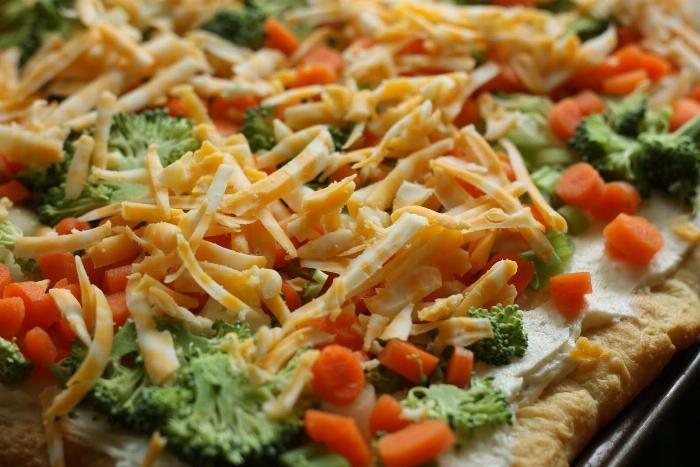 5Spread the sauce mixture on top of the cooled crust and evenly distribute the carrots, celery, cucumber, bell pepper and broccoli on top of the cheese spread. 6Serve at room temperature or slightly chilled.